I remember buying a book, a few years back, called Fearlessness. It was the story of Lisa Anderson, a world champion surfer, who was one of my heroes growing up at the beach. Her story was incredible and I remember being really inspired by the book. So much so, that for a while after reading it, anytime I felt some kind of fear, I would say the word ‘fearlessness’ in my head and use it as a mantra to summon up my courage. I’d say it as I was sitting on the beach, trying to decide if the surf was too big for me or not. I’d say it before an important meeting or if I was travelling alone and felt a sense of uncertainty. For a while there, it worked for me. Skip ahead six or seven years, and I no longer say that word. In fact, I’d go as far as saying that I think fearlessness is an absolute myth. The idea that any of us can live a fulfilling life without fear is crazy. But if it has to be a part of our journey, surely there’s a better way to deal with it? I know I’ve made some pretty crazy mistakes whenever fear has been in the driving seat. I’ve experienced more fear in the last few years than I care to think about. But I’ve realised something important in the process. A way of detaching from the fear and being able to look at it with a different perspective. I saw this photo of street art in Rio on a blog last week and it summed it up perfectly. The moment I saw it, I smiled and agreed. Yes. 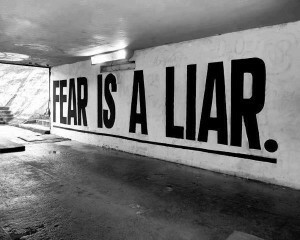 Fear is a liar. Fear will make up stories in your head. Fear will stop you in your tracks. Fear would rather you shrink than grow. This is my new mantra for those times when I feel like fear is running the show. It reminds me to look carefully at whatever it is that I’m fearful of and question it. What is it that I’m scared of? Is it even true? So this is what I want you to do next time fear comes knocking at your door. Take a deep breath, open the door, say hello (it’s important to acknowledge fear), ask it what it has come to tell you, then smile sweetly and say ‘I don’t believe you’. Originally published at www.helloglowcoaching.com on May 14, 2015.